Want to dress like you own the joint, well there’s no better way than with one of these Pimp Fancy Dress Costumes, brilliant for Music or Decade themed fancy dress occasions, also serves as a great Comedy Costume. We have loads of fun costumes and accessories that are guaranteed to make you the talking point of any fancy dress party! 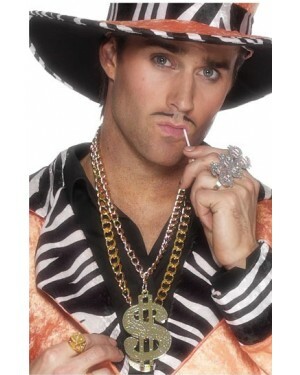 Transform in to a wealthy rich guy with some of our great Pimp Fancy Dress accessories and costumes, ideal to suit anyone with a big ego! Whether or not you decide to go all out and dress up, or if you’re on a budget and want to accessorise, we have lots of bling to keep you satisfied. Gold Rings are an absolute essential to any Pimp Fancy Dress, to make things even better, they’re great-value and they send out the right message of what look you’re going for. In addition to the rings, you can also partner them with a Three-Layer Gold Chain, if that doesn’t convey wealth; we don’t know what else will. If you’re specifically looking for Pimp Fancy Dress Costumes, we have just the thing. A favourite amongst most, this Gold Rapper Costume is something else; you can’t be missed wearing this fab outfit!